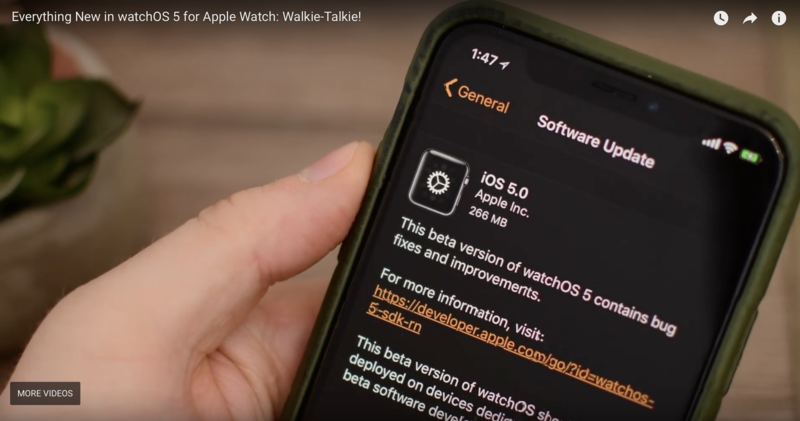 Doesn't that usually say watchOS x.x? I have not seen anywhere a mention of whether this needs a cellular model or if this feature can use a coupled iPhone for the WalkieTalkie backhaul. I have not seen anywhere a mention of whether this needs a cellular model..
Not mentioned I’d bet it does not need cell model watch. Per 9to5Mac, works via iPhone & WiFi. Also works via cellular as well. Like I commented on a previous article: "...I hope there is some way to "deny" an incoming call." It seems that the Do not Disturb option will work when you can forsee a certian time when you don't want to be disturbed, but I can imagine this being cumbersome to remember resulting in not always being activated At the time when I made the original comment, the responses from other posters seemed to indicate that you had to accept the conversation invite for every "session", but after watching this video it seem that the comment everyone has been quoting, namely: "To establish the session, the user needs to select a contact they want to use Walkie-Talkie with, prompting a request on the recipient's Apple Watch asking to start a conversation. Once accepted, the connection is made, and users can communicate via the push-to-talk system. " applies to a one time addition of contacts into the group of people who you will use this feature with rather than every time you want to start a conversation. So, I hope you can just put your hand over the screen or something to prevent a shrill voice yelling at you from your wrist when you are indisposed. For example when you are in the restroom, impromptu meetings at work, while in the middle of a face-to-face conversation with another person, and the list goes on. I wonder if this "denial" would then some how alert your "caller" to the fact that you are in the middle of something so they just don't keep blowing you up. 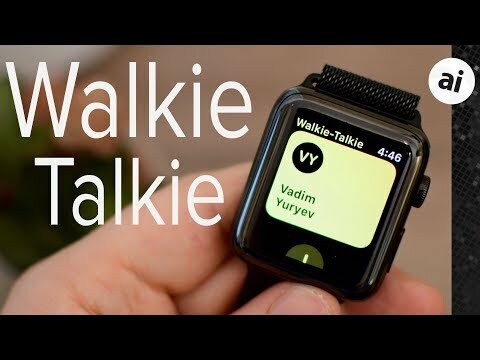 The Walkie-Talkie uses Face-TIme audio. What wasn't mentioned here was the chirp or beep alert that you get on an incoming W-T. Like the Nextel phones, that could/will get annoying quick. I'd like the option to disable that alert tone and use the Taptic engine instead. The Available Toggle is a good thing, but I'd like to see it part of the Watch's Control Center. It would be handier to use, I think. I like the idea of a hand on the screen to deny a call. I'd also like to see a text automatically sent, either a canned 'Can't talk right now, will call you back' or a message you create. The down side is that will probably be a bigger violation of Peace and Quiet Etiquette than the people who stand next to you and use the speaker phone, talking louder than they need to. It does FaceTime Audio, but it wished it did work like Nextel devices. I do hope that Apple has plans for this outside of the current setup. For example, making deals with cruise ships, for example, that have WiFi nodes and cellular towers that will allow families and friends to connect locally on the ship without any costs since we're only talking about a short burst of audio through a local system (not uplinked to the satellite). Maybe a per user fee for the entire cruise would be in order, but it's really not too hard to get this to pass FaceTime audio freely through their firewall while staying locally. This could also be a boon for Watch sales. I've thought about such a system for decades of cruising (just have been bringing real Walkie Talkies with me). If was going again and this was an option I'd be making sure everyone I'm with had a Watch that would support this feature. Unfortunately I think this might be stymied by that patent troll going after Apple's original peer to peer Facetime system. Apparently that's why it was never open-sourced either, since Apple has to provide server support for the backend. Think the Walkie Talkie feature is pretty cool, just wish more of my friends had the Watch so I could use it. Oh.my.gosh. It's a bit irrational, but I get really steamed at this kind of thing. Patent trolls need to go away. Was expecting to see it demoed in the video, would make its use clearer.